I said it before, my Sourdough is, together with dedication from me and everyone in supporting the project, a important asset in The Bread Exchange project. Thousands of stories are captured in that little smelly jar. A sourdough can survive a lot . It is full of healthy bacteria which takes care of most unfriendly stuff that comes into the jar. The only thing it can NOT handle is heat. You can imagine the uncomfortable feeling I got in my stomach the other day on the train down south to Nürnberg and realized that I had forgotten my sourdough on the kitchen sink. Crap. With the radiator on full force. It would not survive. What should I do? Thank God for the Bread Exchange network. I started thinking who could possibly save me, and the sourdough. I called up Anna, a Berlin girl I have continuously been trading bread with since the first trade 3 years ago where I baked for a gallery opening of hers. 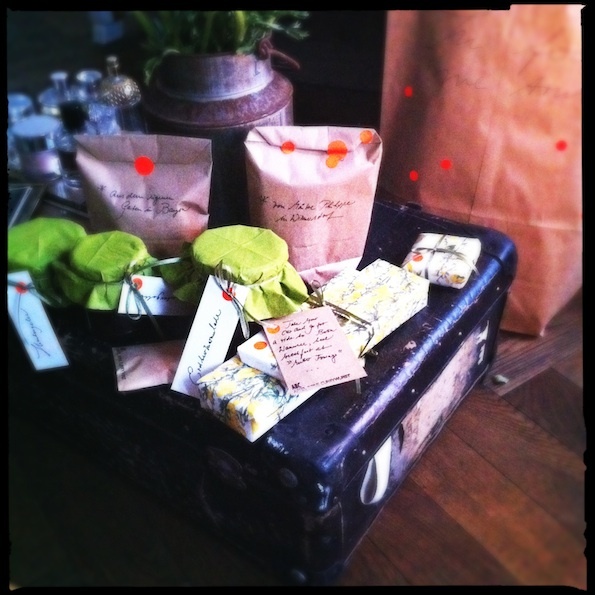 In return she traded a whole bag of her favorites; French raw milk butter, dried apples from the garden of her family’s bavarian summer house, home made jam, and – my favorite – a card with her personal favorite secret hideaway in Berlin. Actually, Anna even met her Boyfriend at a bread exchange trade. She came to my place to trade bread as I was having a shoot at my apartment with a film team from London. Who would have thought. Anyhow. Anna got the key, and within a day or two the sourdough was chilling in my fridge again. Thank You! This project would be nothing without the people supporting it. Oh, by the way, Anna is also part of the Bread Exchange book. She has traded a recipe with me.